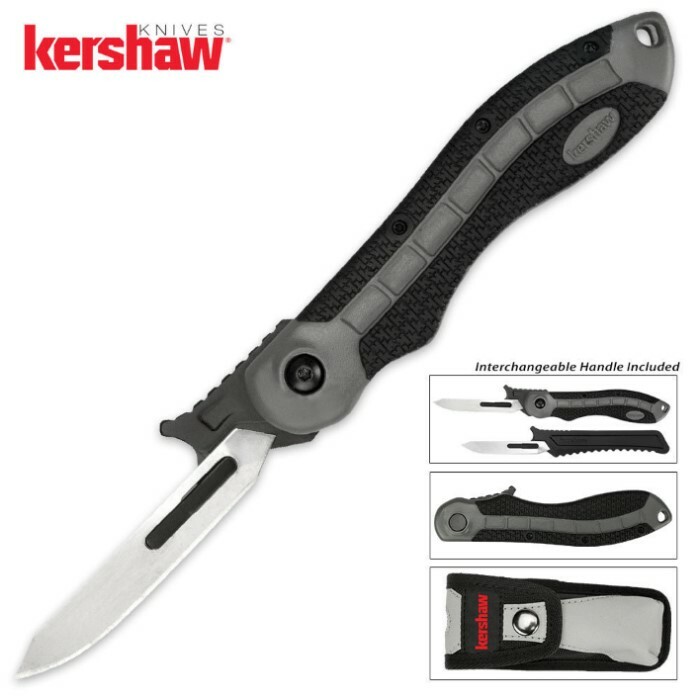 Kershaw LoneRock RBK Skinning & Caping Folding Knife | BUDK.com - Knives & Swords At The Lowest Prices! Kershaw delivers a modern take on skinning and caping knives with this innovative LoneRock RBK knife. This precision skinner comes with 15 slim, scalpel-like steel blades that make fast work of skinning, caping and other detailed jobs. The LoneRock also offers a comfortable glass-filled nylon handle with Kershaw's exclusive K-Texture grip. A sturdy liner secures the blade firmly into the open and locked position during use. Finally, the LoneRock also includes an extra "buddy" handle that holds an RBK blade so that you and your hunting buddy can double down on the skinning work and get the job done quicker.